A small Irish firm is attracting customers with its innovative holographic assistant, a life-like display which uses the image and voice of a real person to interact with and assist customers, writes Trish Dromey. A small West of Ireland firm has become the first in the world to take interactive holograms off the movie screen and make them real. 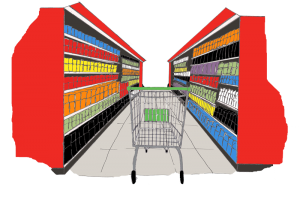 The grocery market has shown signs of returning to growth, according to the latest supermarket share figures from Kantar Worldpanel in Ireland, for the 12 weeks ending April 27. David Berry, commercial director at Kantar Worldpanel, explains that during the recession shoppers turned to "little and often" shopping to control their spending. Industry body Retail Ireland has called on the Government to cut the country's personal tax burden to boost spending and stimulate the domestic economy. Retail Ireland said that while it expects to see a meaningful recovery in the retail sector this year, high personal income taxes continue to impact consumer consumption. It has recommended that the Government raise the entry level to the higher marginal income tax rate. In turn, the marginal rate should be reduced to below 50 percent. Irish grocery retailer, SuperValu, is the most reputable Irish brand, according to the results of the annual Ireland RepTrak 2014 study announced by The Reputations Agency today. SuperValu scored higher than any other Irish firm in the research, coming second to global car giant Volkswagen in the overall results. Tesco Ireland chief executive Phil Clarke has defended the retailer's 'Price Promise' initiative, saying it has helped boost price perceptions at the retailer. "Price Promise has not been disappointing for us at all," Clarke told Retail Intelligence. "Our price perceptions are at the highest level for many a year, and our customers are telling us that they really value it. ASK Tesco CEO Philip Clarke how he plans to stop budget food stores from taking more of his customers and he'll talk about Amazon.com and Apple instead. Rather than battle retailers such as Aldi on price, Clarke is modelling Tesco on the tech giants, building a digital one-stop shop centered around its Hudl tablet that includes everything from movies to banking. Tesco Ireland is to undertake a €2m project that will see a number of its stores retro-fitted with more energy efficient lighting. The project is the first to avail of the €70m Irish Energy Efficiency Fund, which was established by the Government to help companies undertake energy efficient projects. The Musgrave Group has commenced a restructuring programme in its British operations, aimed at turning around the fortunes of adivision largely responsible for the group making a loss of nearly €95m last year. The Cork-based grocery and food service group — which owns the likes of the SuperValu, Centra, and Daybreak brands in Ireland and UK players like Budgens and Londis — yesterday reported a pre-tax profit (before exceptional items) of €60m for 2013. The good people at Tommy Hilfiger know that when it comes to Summer in Ireland it's best not to rely on the weather to keep our spirits up. So they, along with LIFE Magazine, are enlivening us with a Summer shopping evening of live music, canapés and refreshing drinks to indulge in while browsing the stunning new summer collection in both the Dublin and Cork stores. There's also a chance to win a fabulous trip to London for two with two nights' accommodation at a four star hotel and €1,000 of Tommy Hilfiger gear. Half of Irish consumers plan on hosting barbecues over the summer months, according to the latest Consumer Insights survey by Empathy Research. Of 1,010 respondents, those aged 45+ (44%), were most likely to host a barbecue this summer than all other age groups; 18-24 (52%), 25-34 (54%), and 35-44 (53%). The influence children have on family purchasing decisions is most evident in the Cereals category, according to a new study by Carat. Just under a third of respondents (32%) said that children 'greatly' influence Cereal purchasing, with 51% saying that they 'somewhat' influence purchases in this category. Cadbury dominated the out of home advertising market in March in the Food & Drink sector, according to the latest Posterwatch report from PML Group. The Mondelez International owned brand accounted for the top three Food & Drink OOH campaigns during the month, with advertising for its 'Egg n Spoon' brand accounting for €323k worth of spend, Dairy Milk accounting for €318k worth of spend, and Cadbury Sandwich accounting for €308k worth of spend. Londis has unveiled a new charity partnership, '€60k For 60 Years', which will see the retailer donate €60,000 to three charities, Pieta House, the Irish Hospice Foundation and Temple Street Children’s University Hospital. The charity partnership was announced to coincide with the 60th anniversary of the formation of the ADM Group this year.